Over the last few years, you may have noticed memes or infographics on Facebook that show what the different toothpaste color codes mean. Different products at the grocery store have different colored squares on their packages. While these may seem like a mystery to many people, online rumors say that the colored squares on your packages of toothpaste represent toothpaste color codes. Are Toothpaste Color Codes Real? While this myth is extremely persistent, it is not based in fact. 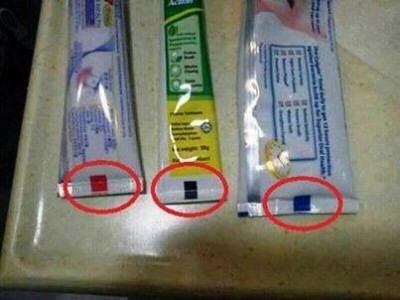 The colored squares on toothpaste packages are not related at all to what is actually in the toothpaste. Instead, these squares are known in the industry as eye marks or color marks. They are used in the manufacturing process to show where the package should be folded. They may also be used to help machinery spot the right interlocking units as the packages speed through the machinery. These eye marks are used because they can be easily picked up by the machinery’s light beam sensors. If you actually want to find out what the toothpaste is made of, you can read the information on the package or look at the list of ingredients on the side of the box. What Is an Eye Mark? An eye mark is the colored square that you see on the box. It is shaped like a rectangular and is designed for an electric eye to spot. It is often on the edge of the material and shows where the package can be cut or folded. These marks are called eye marks because they are read by an electric eye during the manufacturing process. One of the easiest ways to debunk the myths about eye marks is that there are far more colors of them than listed in any of the graphics or memes. 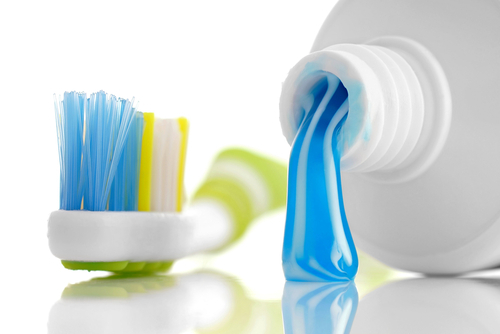 The toothpaste color code that you see is meant to be used for different types of sensors and packaging. The colors can be used to help the machine decide which side of the box it is looking at or where to fold the tube. They are also used to make sure that the machine puts the brand name, logo and ingredient information on the correct sides of the package. Next articleClear Stretchy Vaginal Discharge: What Is It?